Dearborn offers an assortment of college-level textbooks to support your existing real estate curriculum or to incorporate into a new program. 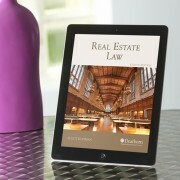 Our college and university texts are written by professional higher education instructors who are experienced in the real estate industry. Available in textbook or eBook format! Check back with us throughout the year as we release more titles!